Aristotle University / Chemical Engineering Dept. Marc Assael (PhD IC, UK) is Professor of Thermophysical Properties, Aristotle University, 1998 TEPCO Chair Visiting Professor Keio University, Tokyo, 2007-2011 also Adjunct Professor Jiaotong University, Xi’an. Published more than 150 papers, 140 in proceedings, 27 chapters,9 books. Member of Editorial Board of journals, national delegate in EU (ESFRI, EUREKA), in EFCE, and IUPAC, IAPWS, IATP. Marc Assael received his PhD from Imperial College in 1980. In 1982 he was elected Lecturer in Heat Transfer in the Faculty of Chemical Engineering at the Aristotle University of Thessaloniki, where he founded the Thermophysical Properties Laboratory. In 1986 he was elected Assistant Professor, in 1991 Associate Professor, and in 2001 Professor of Thermophysical Properties at the same Faculty. During the years 1991-1995, 1997-1999, 2009-2011 he served as the Vice-Chairman of the Faculty, and during 1995-1997 as the Chairman of the Faculty. In 1998, Marc Assael was TEPCO Chair Visiting Professor in Keio University, Tokyo, Japan, while during the years 2007-2012 he also held the position of Adjunct Professor in Jiaotong University, Xi’an, China. He has published more than 150 papers in international journals, 130 papers in conference proceedings, 26 chapters in books and 9 books. In 1996, his book Thermophysical Properties of Fluids: An Introduction to their Prediction (coauthored by J.P.M. Martin & Th.F. 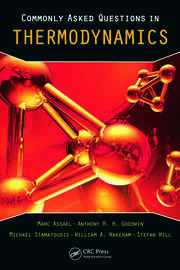 Tsolakis) was published by Imperial College Press (a greek edition is published by A. Tziola E.), while in 2010, his book, Fires, Explosions and Toxic Gas Dispersions: Effects Calculation and Risk Analysis (coauthored by K. Kakosimos), was published by CRC Press. In 2011, his lattest book Commonly Asked Questions in Thermodynamics (coauthored by S. Will, A. Goodwin, M. Stamatoudis and W.A. Wakeham) was published by CRC. Marc Assael is a national delegate in many committees in the European Union, in the European Federation of Chemical Engineering as well as in many international scientific organisations.